The Sutton Hoo Society was founded to help the archaeologists involved in the 1980s dig by providing a knowledgeable guiding service; in essence to keep the public informed and at the same time to allow the archaeologists get on with their tasks. We rapidly decided that we would plough back into the project the funds from guiding and fairly quickly we found we were doing both guiding and also providing small requirements for the archaeologists. We are a registered Charity, no 293097, and over the years as our income has grown we have been able to reach out to a number of projects which are relevant to our charitable aims of improving the understanding of Sutton Hoo or of Anglo Saxons and Anglo Saxon England. We have had only two presidents in our time, and we are very proud that our first president was His Royal Highness the Duke of Edinburgh. The Final Report was planned to contain drawings and photographs of all manner of things to illustrate the rich archaeology of the site. Both valuable objects and less oh-my-gosh worthy soil levels needed to be explained to get a full picture of the site and the excavations. With the passage of time and the steady increase in the number of objects it became evident that help was needed if a really comprehensive story was to be told. The grant was given to provide extra illustrations and we can‘t say exactly which illustrations were funded by our grant and which by the original plan. However, as a representative of the high quality of workmanship, we are showing here an illustration of part of the horse harness fittings from Mound 17. A young warrior and his horse were buried here and the archaeologists were astonished to find a full Anglo Saxon horse harness complete with delicate gold designs attached to the bronze backing plates and mineralised leather straps. This was our second grant in ‘modern times’ back in the days when the National Trust had bought Sutton Hoo but the museum and reception buildings had not yet been built. Carbon dating is very complex and demands scrupulous handling of both the equipment itself and the samples being dated. 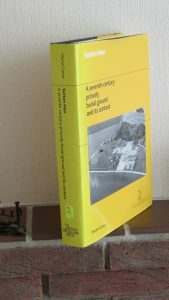 The larger book on the 1980s and 1990s archaeological dig (‘Sutton Hoo, A Seventh Century Princely Burial Ground and its Context’, Martin Carver 2005, British Museum) credits the Sutton Hoo Society at various times with buying a theodolite, wet sieve, flotation tank, marquee, tarpaulin, scaffolding, answerphone, generator, kitchen facilities, a tower, sieves and a mobile home (see introduction p xxviii). Whilst we no longer have a record of exactly why this grant was made or what it was used for, our financial records do show the date and the amount. By 2002 Professor Martin Carver had been Professor of Archaeology at York University for a number of years and we believe that this was funding to prepare for the final report. Creating the Exhibition in an empty hall from scratch was a mammoth task and started as a lot of head scratching whilst peering at empty sheets of paper. Eventually it all began to drop into place when it was decided that the centre of the exhibition should be a reconstruction of the king’s burial in a replica ship sunk below floor level with explanatory panels and other parts of the story laid out round about the central grave. This inevitably called for professional services, replicas and the like and the Sutton Hoo Society made a grant to purchase replicas of weapons and armour. exhibition hall. © National Trust. . The Sutton Hoo Society’s main task from its start in 1984 was to provide a tour guide service that both informed the visitor of what was going on at the time and also what had been achieved up to that date. At the same time it allowed the archaeologists to get on without being interrupted by the public. The Society also helped with archaeological equipment, wheelbarrows, sieves and the like and we provided field telephones for communication back in the days when radios were large, expensive and needed licences. So nearly 20 years later it was natural to fund the purchase of radios so that staff could keep in touch over the 365 acre site. The archaeologists also found a socketed axehead from the bronze age not far away from the fish trap, so perhaps there had been fishermen or even villagers living not too far away for many hundreds of years. This was a project to build a replica of the ship King Raedwald was buried in. After a promising start with input from a number of museums and other organisations the project eventually foundered when the contributors could not agree on how it should be carried forward. Today in 2016 there is another project to build a full size replica and put it on permanent display in Woodbridge, just across the river Deben from Sutton Hoo. In the meantime there is what is often called ‘a half size replica’ built at their own expense by Dr Edwin Giffard and his wife Joyce. All the dimensions are half the original; both length, width and height. Sae Wuffing also differs significantly in that it has a sail whereas the original King’s ship has no mast step or other fitting that suggest that it ever did anything other than be rowed. 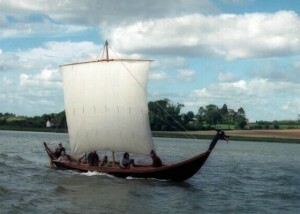 The Giffards built Sae Wuffing and an Anglo Saxon trading ship, not as replicas, but to demonstrate that they could have been sailed and the results of their researches are recorded in maritime papers. Historians and others now know quite a lot about what used to be called ‘The Dark Ages’ and can tell you, with some confidence, about the people, their buildings, what they wore and their way of life. What we have little information on is the land and what it looked like at that time. It was with this in mind that the Sutton Hoo Society approached the University of East Anglia and Professor Tom Williamson to consider what, if anything, might be done to fill in at least part of this void. Professor Williamson and his assistant Sarah Harrison considered all manner of evidence. Maps and documents went back so far, but in the end it was painstaking work with pollen seeds and then dating them by x-ray analysis that revealed the answer that Sutton Hoo had been part of an extensive heath land with very few trees. The acid soil was sandy and very poor and had been deposited by glaciers in a wide swathe from Ipswich in the west to Lowestoft in the east. The poor soil nevertheless attracted Anglo Saxon farmers because it was easily worked, mound 2 © Michèle Abson much more easily that the heavy clays just a few miles to the north. Tom Williamson’s book, ‘Sutton Hoo and its Landscape’ was published in 2008. An archaeological dig is a bit like an iceberg, you can see the bit above sea level, but there is much more hidden below. For a dig you can usually see people working slowly away in muddy trenches in the distance and if you are lucky there may be a display of recent finds. But when the archaeologists have finished digging a different kind of work begins. All the finds and points of interest have to be dated and brought together and related to each other, and then drawn, photographed, carbon dated, chemically analysed, etc., in order to make a scientifically detailed report of the site and its contents. It is not unusual for this post excavation analysis to cost considerably more than the dig itself. If the site is of sufficient interest it may also warrant a booklet and in this case not only a ‘short’ booklet (Sutton Hoo, Burial Ground of Kings), but a more detailed 530 page book covering all the important aspects. We were pleased to contribute towards the costs of publication. 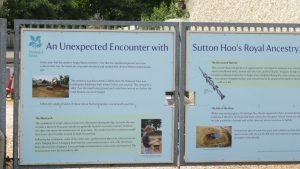 For some years after the opening of the Sutton Hoo site, the National Trust ran two exhibitions a year, a longer duration one in summer and a shorter one in winter. On two occasions the Sutton Hoo Society helped out with costs or content. In 2006 we helped with a grant towards the costs of mounting the exhibition, and in 2010 we were able to provide a number of sound quotations from our Oral History archive, specifically from interviews with the team led by the British Museum who re dug and checked the king’s ship in 1965 for a few artefacts and some specific pieces of information which would help interpret the story of the burial of King Raedwald in his ship. 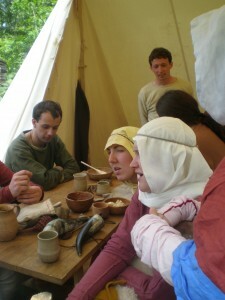 Four years after the site opened the National Trust decided to evaluate the idea of an Anglo Saxon Festival, at which people in authentic Anglo Saxon costume would ply Anglo Saxon trades and sell Anglo Saxon artefacts to site visitors. The Sutton Hoo Society undertook to cover the start up costs and we were compensated out of receipts, so that although we made a grant of £3,500 we got nearly all of it back. Peppy Barlow was intrigued by the story of the finding of King Raedwald’s fabulous treasure in 1939 and particularly the interaction of the characters involved. 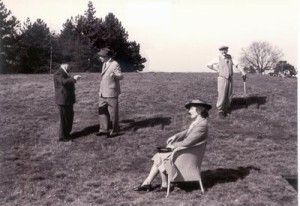 The photograph shows actors playing, from left to right, Guy Maynard of Ipswich Museum talking to Charles Phillips the Archaeologist, Mrs Pretty, the lady who owned the land, is seated and Basil Brown, who actually did the work and found the ship, is on the right. The Sutton Hoo Society funded the making of a CD by Peppy Barlow, so we have a permanent record of her endeavours. The Venerable Bede, died 735 AD, never seems to have left his Northumbrian monastery, yet he managed to write some of the most respected and wide ranging books of his or any other age. In his Ecclesiastical History of the English People he mentions that ‘the place of the king’ [of East Anglia] ‘is at Rendlesham’. Ever since then people have suspected every hump and bump in the parish might hide evidence of ‘the place of the king’. 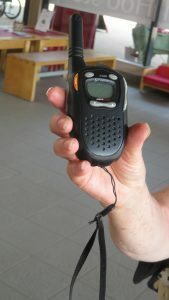 Finally in 2009 illegal metal detecting or nighthawking suggested that a proper organised investigation was called for so that the evidence, if any, could be recorded and, if thorough, would leave nothing behind for future nighthawks. In 2009 Suffolk Archaeological Unit proposed a preliminary survey to check the feasibility of further work. We were proud to contribute £8,620 to the project in 2009, and a further £2,300 in 2010 when additional work was needed to provide a full picture. The results of this evaluation suggested a four year programme was needed to cover the area and the Sutton Hoo Society was again pleased to be associated with the project, contributing £5,880 in 2012, £5,800 in 2013, £5,000 in 2014 and £5,777 in 2016. Unsurprisingly the final year showed that a small area still needed to be covered and we made a further grant of £1,400 later that year. 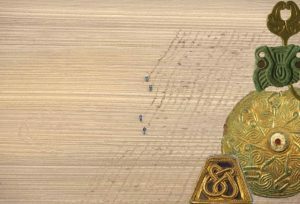 The photograph shows the County Council’s four metal detectorists methodically working over a ploughed field, with a montage of Anglo Saxon objects on the right. In 1939 when the great treasure was discovered, Mrs Pretty lived in the large house on the site, called Sutton Hoo at that time, although it is now called Tranmer House in honour of the Tranmer family who left the estate to the nation. The large reception room on the ground floor, which is open to the public, has portraits of Mrs Pretty and her son Robert facing each other across the room. 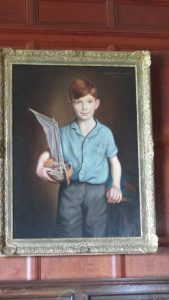 Robert’s portrait by Cor Visser was beginning to deteriorate in 2009 and the National Trust were unable to fund the restoration themselves so asked the Society to help. Robert (born 1930, died 1988), is famous, or perhaps notorious, for an unusual find in mound 1 at Sutton Hoo, the royal grave. In the mid 1960s resting on the Anglo Saxon layers of the mound was a roller skate. Archaeologists worked out that it was unlikely to be an Anglo Saxon roller skate even though it was resting on an Anglo Saxon layer and finally suggested that perhaps Robert Pretty had lost it whilst playing there on some previous occasion. 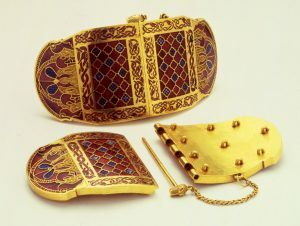 The National Trust applied for a grant to make a high quality replica for permanent exhibition of one of the most noticeable objects in the king’s grave. It was a singular object not matched anywhere else in Anglo Saxon possessions. It has been variously called a ‘whetstone’, a ‘sceptre’ and a ‘stone’, because no one knows what quite to make of it. 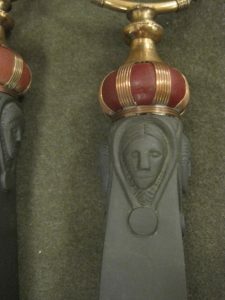 Master mason Brian Ansell spent some 400 hours carving the four and a half kilogram weight stone and the unusual metal terminals were made by Ganderwick Creations. It had been known for a long time that the four faces at each end, men at the bottom and ladies (or just possibly, beardless men) at the top were all different, but during the carving and comparison with the original in the British Museum it was seen for the first time that one of the men had had his eye struck out, a direct reference to the god Woden who traded his eye for knowledge. So in making the replica we learned something that had been forgotten for 1400 years since it was buried in 625 and missed since it was dug up in 1939. At the same time a replica of the great gold buckle was made for demonstration and handling on burial ground tours and other occasions. During the 1982 – 1991 archaeological campaign a number of new (well, new to modern eyes) mounds were found at Sutton Hoo. Over the years these mounds had either been ploughed down or had just subsided until they no longer showed above the landscape. Mound 17 contained a young warrior buried on one side of the centre and his horse, a full sized Anglo Saxon horse of 14½ hands, on the other. Mound 17 and King Raedwald’s grave in mound 1 are the only graves, so far, which have not been robbed. In the case of the young warrior there was a robber hole right in the middle which fortunately missed the burials on either side. Horse burials are rare in Anglo Saxon times as horses were very expensive items in those days, and to have a horse marked you out as one of the really well off elite. To be buried with a horse then was a bit like being buried with your Lamborgini today. But the real find was not the rareish horse, but the horse’s bridle found just above the young warrior’s head. Fortunately for us the young warrior was rich, but not very very rich, and the leather bridle did not have solid gold decorations but bronze joints with gold plates attached. The bronze mineralised the joints in the leather and for the very first time, archaeologists could be sure what an Anglo Saxon bridle looked like. Whilst the original 1400 year old finds from Mound 17 are on display in the exhibition hall at Sutton Hoo you don’t get an impression of what the bridle looked like in use. The Sutton Hoo Society was pleased to give the National Trust a full size replica of what the original must have looked like. 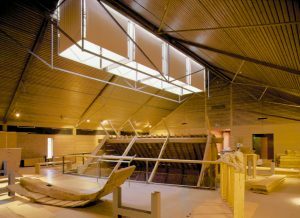 When the National Trust acquired the Sutton Hoo site and before any building began, the first job was to see if anything archaeologically interesting lay under the proposed Reception, Museum and car park areas. It was known that the royal palace was at Rendlesham, some 3 miles away, and what few pieces had been found up to that time, were thinly scattered over the surrounding parishes. Fern Archaeology found under the museum and car park areas a number of burials dating to the late 500s, forty or so years before King Raedwald’s death. While they were reasonably rich, judging by their grave goods, they were quite certainly more like well off villagers rather that members of the Royal family. 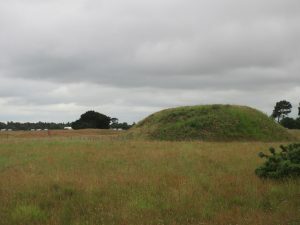 The Sutton Hoo Society provided funding towards Accelerated Mass Spectrometry (think Carbon Dating) dating of the finds. It was known that a small number of Anglo Saxons were important enough (or their families were powerful enough) to be buried with a horse in the same grave or in a separate one alongside the human burial. 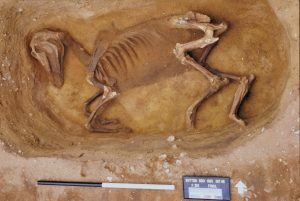 Surprisingly although most of the individual horse burials had been well researched and well written up, no one seems to have looked at horse burials as a group across all the Anglo Saxon speaking peoples in Europe. We are pleased to have helped fund this project. 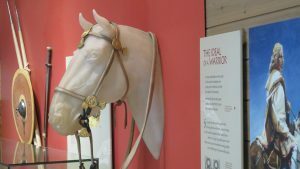 The National Trust decided to change the exhibition space at Sutton Hoo to demonstrate on a permanent basis some of the great treasures as well as having an area set aside for original pieces. 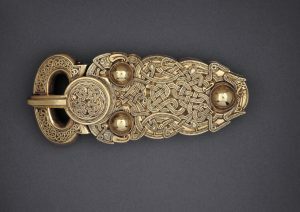 The Sutton Hoo Society was pleased to be asked to fund the purchase of replica shoulder clasps. Two are on permanent display in the treasury room of the exhibition and a further shoulder clasp is available for educational purposes. 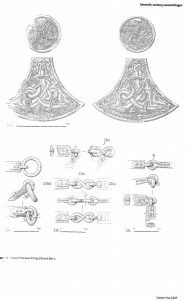 As part of the same project to provide permanent illustration of the great treasures, the Sutton Hoo Society funded copies of the sword fittings (the buttons and pyramids), and the gold and garnet fittings on the King’s lyre. The British Museum are of the opinion that the sword buttons and the sword pyramids are examples of the very highest quality work produced by Anglo Saxon goldsmiths anywhere in Europe. We were fortunate to get Ganderwick Creations to make these replicas to their very high standards. As a result of this and other work, Ganderwick Creations are now working on making replicas of some of the Staffordshire hoard. Anglo Saxon ladies seem to have been held in high regard by their menfolk. There are many elaborate burials of ladies with significant possessions and indeed they were called ‘peace weavers’ and ‘shield maidens’, and quite a number of Royal Princesses spent much of their lives as Abbesses of important churches. So we were delighted when we were approached to see if we would help with funding for a University project. Girdle hangers, the belt and droppers holding keys to important places, are known from a number of burials and we have one here at Sutton Hoo in mound 14 where a girdle hanger was found, but unfortunately no trace of the lady who owned it. Ipswich museum, part of the Colchester and Ipswich Museum Service wanted to acquire a number of pieces of Anglo Saxon jewellery which neatly illustrated local finds which were presumably lost by local people, although they can no longer be identified as such. We gave £2,000, £2,000 and then £3,0000 to Ipswich museum over three years to help, is one. The original is now on display at the museum. 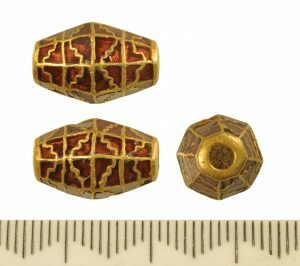 How the original goldsmiths constructed such fine gold cells and cut the garnets with such precision is still a matter for debate among museum experts. On the 75th anniversary of the finding of the King’s treasure in 1939, the National Trust asked for a small amount of help to stage ‘Gold Under the Bed’. The play gives voice to the thoughts of the landowner, Mrs Pretty and archaeologist Basil Brown, as first the burial mounds were opened and then the treasure was found. There are any number of items from King Raedwald’s grave that are not yet available for display at Sutton Hoo, although the list is slowly getting shorter (see the shoulder clasps, belt buckle, sword fittings above). 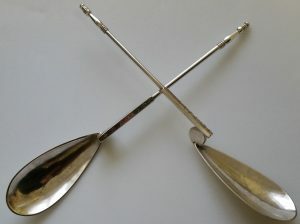 The most recent purchase has been the two ‘baptismal’ spoons. ‘Baptismal’ in inverted commas because we really don’t know the story of why they are in the grave. The Venerable Bede tell us that King Raedwald was baptised in Kent around 604AD and put up two altars side by side in his temple at Rendlesham, one to his old gods and one to his new Christian god. The spoons seem to be a standard Roman pattern and are marked ‘Saulos’ and ‘Paulos’ in Greek letters on the handles, which speaks of the conversion of heathen Saul to the Christian Paul, so they may be tokens of Raedwald’s baptism. Christianity did not come to East Anglia until some 25 years after King Raedwald was buried. So, in true Sutton Hoo style we are left to wonder could he read Greek? If not, would he have known which one was which? Like so many things at Sutton Hoo, there are more questions than answers. But we are really glad to have copies of the spoons. You can see from the illustrations above that we have supported a wide range of topics, large and small, national, university, county, charity and other investigations. The common theme linking them is that they must, according to our Charitable aims, further our knowledge of Sutton Hoo or the Anglo Saxons. We only fund organisations, not individuals, and we expect to publish the results in Saxon or elsewhere. If you would like to apply for funding towards you project please contact the Society. We have a standard form so that we are able to compare like with like if we have to chose which application to support, and the Committee’s decision is always final.